Rising interest rates have put a dampener on some home owners servicing mortgages. But it also means it's a good time to look at the type of loan you have and whether it might pay to switch. Banks offer different rates at different points in time, based on the supply and demand of funds at their disposal. However, opting for the cheapest rates does not work for every home owner as individual needs vary. There are two broad categories of home loan options to consider - fixed rate and floating packages. Fixed-rate loans - where rates are set in stone, so to speak, for the first two to three years - are suitable for borrowers who want their monthly instalments to remain stable. If you believe interest rates are likely to go up in the next 12 months or so, consider a fixed-rate package as it allows you to lock in at a relatively lower interest rate for a specified period. You will not be affected if the bank raises rates during the lock-in period. If you have read the market wrongly and the rates move south, you will be stuck with fixed interest rates during the lock-in period. These packages are pegged to the Singapore Interbank Offered Rate (Sibor) or other benchmark rates like the fixed-deposit rate. These rates are what banks use to determine mortgages for home loans. Banks usually tack on a premium, also known as a spread, on top of the benchmark rate. Such packages offer price transparency. They are popular in a declining interest rate environment as borrowers enjoy lower instalment payments when the benchmark rates decline. We are in a rising rate environment. Interest rates have hit a 10-year high with the key three-month Sibor rising from 1.12 per cent as at the end of August last year to 1.63 per cent now, up about 46 per cent. 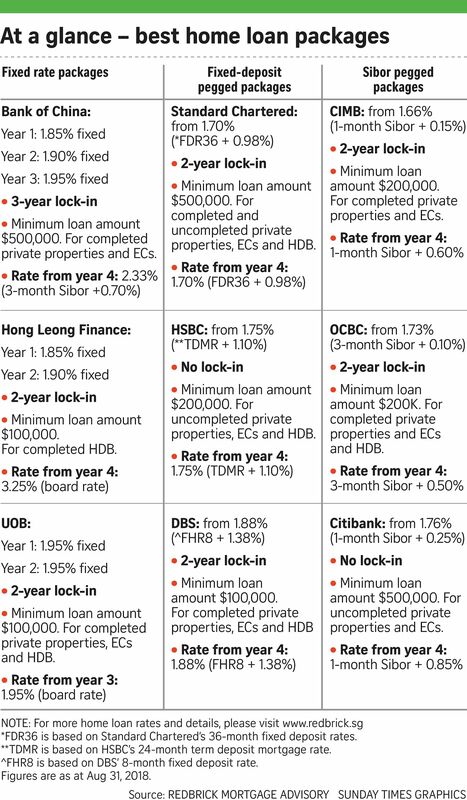 Customers with a Sibor-based mortgage have likely received more than one repricing letter from their lenders this year in the light of the higher rates. Here are three tips to note before you switch home loans. Find out if the savings outweigh the costs of refinancing. Redbrick Mortgage Advisory director Eugene Huang says if you are sitting on a Sibor-pegged rate, you could be paying over 2.5 per cent in interest. If you refinance to a 1.7 per cent floating rate based on a loan of $500,000, you will save about $4,000 a year. Check if the savings outweigh refinancing costs, especially if you are in the lock-in period. If your package comes with a lock-in period - usually two to three years - you are subject to a penalty if you withdraw your loan. Lock-in penalties can range from 1 per cent to 1.5 per cent of the outstanding loan amount (typically 1 per cent if the loan was for an uncompleted property, and 1.5 per cent if it was a completed property), notes Mr Huang. A $500,000 loan could attract between $5,000 and $7,500 in penalties if you refinance within the lock-in period. It does not make sense to refinance if you plan to sell within the next 12 months. This is because you have to incur redemption fees, which include refunding legal subsidies or cashbacks to the banks. Legal subsidies could range between 0.2 per cent and 0.4 per cent of the loan amount. Another thing to note is that some banks require borrowers to redeem the loan on the interest review date. Failure to adhere to these specific dates will attract a penalty of up to 1.5 per cent of the outstanding amount, says Mr Huang. Note that you have to give three months' notice to your existing bank before switching.